Our research focuses on the cell surface and, in particular, on the structure and function of caveolae. Caveolae are small pits in the plasma membrane which have been linked to tumour formation and muscular dystrophy. We are investigating the role of caveolae in cell physiology and their exploitation by pathogens. 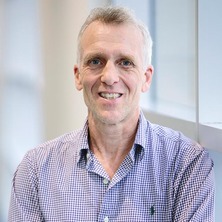 Professor Robert Parton is group leader for Cell Surface in Health and Disease research at the IMB. Caveolae, small pits in the surface of many mammalian cell types, have been implicated in regulation of cell proliferation, endocytosis, and lipid transport. In addition, caveolae and caveolins, the major proteins of caveolae, have been linked to a number of disease states. Caveolins are fatty acid and cholesterol-binding proteins which have been implicated in regulation of cellular lipids. All cells maintain a delicate balance of cholesterol, through regulation of influx, efflux, synthesis, and esterification, which is crucial to the correct functioning of the cell. Our studies have shown that cholesterol is involved in organising plasma membrane signalling domains termed �lipid raft' domains, and that this process is regulated by caveolins. We are using a number of tools to dissect caveolae function including dominant negative caveolin mutants, caveolin-1 knockout mice, and novel Ras assay systems (in collaboration with John Hancock). In addition, we have utilised lower eukaryotic systems, such as zebrafish (in collaboration with Brian Key, School of Biomedical Sciences), to understand the role of caveolae and caveolins in development and in normal cellular function. In vitro studies show that caveolin mutants perturb very specific cholesterol-dependent signalling pathways and disrupt lipid metabolism. Our in vivo studies have shown a role for caveolins in evolutionarily conserved developmental pathways. We have also developed novel quantitative immunoelectron microscopic techniques which have allowed us to visualise lipid raft domains in sheets of plasma membrane prepared from cultured cells for the first time. Are caveolae a cellular entry route for non-viral therapeutic delivery systems? Hill, Michelle M., Parat, Marie-Odile, Parton, Robert G. and Lee, C. Soon (2011) Clearing the confusion of Cav1 and caveolae in cancer compartments. Cell Online, 146 1: . Heterofibrins: Inhibitors of lipid droplet formation from a deep-water southern Australian marine sponge, Spongia (Heterofibria) sp. Mutant huntingtin inhibits clathrin-independent endocytosis and causes accumulation of cholesterol in vitro and in vivo. Kirkham, Matthew and Parton, Robert G (2005) Clathrin-independent endocytosis: new insights into caveolae and non-caveolar lipid raft carriers. Biochimica et biophysica acta, 1746 3: 349-363. Caveolae meet endosomes: A stable relationship? Prior, I. A., Parton, R. G. and Hancock, J. F. (2003) Observing cell surface signaling domains using electron microscopy. Signal Transduction Knowledge Environment, 177 1-12. Harvey, K.F., Shearwin-Whyatt, L.M., Fotia, A., Parton, R. G. and Kimar, S. (2001) N4WBP5, a potential target for ubiquitination by the nedd4 family of oriteins, is a novel golgi-associated protein. The Journal of biological chemistry, 277 11: 9307-9317. Galve-De Rochemonteix, B., Kobayashi, T., Rosnoblet, C., Lindsay, M., Parton, R. G., Reber, G., de Maistre, E., Wahl, D., Kruithof, E. K. O., Gruenberg, J. and de Moerloose, P. (2000) Interaction of anti-phospholipid antibodies with late endosomes of human endothelial cells. Arteriosclerosis Thrombosis and Vascular Biology, 20 2: 563-574. Rojo, M., Emery, G., Marjomaki, V., McDowall, A. W., Parton, R. G. and Gruenberg, J. (2000) The transmembrane protein p23 contributes to the organization of the Golgi apparatus. Journal of Cell Science, 113 Pt 6: 1043-1057. Gordon, D, Smith, R, Parton, R and Kidd, GJ (1999) Developmental regulation of microtubule organisation in oligodendrocytes. Molecular Biology of The Cell, 10 265A-265A. Roy, S., Luetterforst, R., Harding, A., Apolloni, A., Etheridge, M., Stang, E., Rolls, B., Hancock, J. F. and Parton, R. G. (1999) Dominant-negative caveolin inhibits H-Ras function by disrupting cholesterol-rich plasma membrane domains. Nature Cell Biology, 1 2: 98-105. Kobayashi, T., Beuchat, M. H., Lindsay, M., Frias, S., Palmiter, R. D., Sakuraba, H., Parton, R. G. and Gruenberg, J. (1999) Late endosomal membranes rich in lysobisphosphatidic acid regulate cholesterol transport. Nature Cell Biology, 1 2: 113-118. Sincock, P. M., Fitter, S., Parton, R. G., Berndt, M., Gamble, J. R. and Ashman, L. K. (1999) PETA-3/CD151, a member of the transmembrane 4 superfamily, is localised to the plasma membrane and endocytic system of endothelial cells, associates with multiple integrins and modulates cell function. Journal of Cell Science, 112 6: 833-844. Pizarro-Cerda, Javier, Meresse, Stepahane, Parton, Robert G., van der Goot, Gisou, Sola-Landa, Alberto, Lopez-Goni, Ignacio, Moreno, Edgardo and Gorvel, Jean-Pierre (1998) Brucella abortus transits through the autophagic pathway and replicates in the endoplasmic reticulum of nonprofessional phagocytes. Infection and Immunity, 66 12: 5711-5724. Hailstones, D., Sleer, L. S., Parton, R. G. and Stanley, K. K. (1998) Regulation of caveolin and caveolae by cholesterol in MDCK cells. Journal of Lipid Research, 39 2: 369-379. Murphy, C., Zacchi, P., Parton, R. G., Zerial, M. and Lim, F. (1997) HSV infection of polarized epithelial cells on filter supports: Implications for transport assays and protein localization. European Journal of Cell Biology, 72 3: 278-281. Way, M and Parton, RG (1996) M-caveolin, a muscle specific caveolin-related protein (vol 376, pg 108, 1995). Febs Letters, 378 1: 101-106. Krijnse-locker, Jacomine, Parton, Robert G., Fuller, Stephen D., Griffiths, Gareth and Dotti, Carlos G. (1995) The organization of the endoplasmic reticulum and the intermediate compartment in cultured rat hippocampal neurons. Molecular Biology of the Cell, 6 10: 1315-1332. Monier, Solange, Parton, Robert G., Vogel, Frank, Behlke, Joachim, Henske, Annemarie and Kurzchalia, Teymuras V. (1995) Vip21-caveolin, a membrane protein constituent of the caveolar coat, oligomerizes in vivo and in vitro. Molecular Biology of the Cell, 6 7: 911-927. Cidarregui, A., Parton, R. G., Simons, K. and Dotti, C. G. (1995) Nocodazole-Dependent Transport, and Brefeldin A-Sensitive Processing and Sorting, of Newly Synthesized Membrane-Proteins in Cultured Neurons. Journal of Neuroscience, 15 6: 4259-4269. Fra, Anna M., Williamson, Edward, Simons, Kai and Parton, Robert G. (1994) Detergent-insoluble glycolipid microdomains in lymphocytes in the absence of caveolae. Journal of Biological Chemistry, 269 49: 30745-30748. Lutcke, A., Parton, R. G., Murphy, C., Olkkonen, V. M., Dupree, P., Valencia, A., Simons, K. and Zerial, M. (1994) Cloning and Subcellular-Localization of Novel Rab Proteins Reveals Polarized and Cell-Type-Specific Expression. Journal of Cell Science, 107 3437-3448. Pizon, V., Desjardins, M., Bucci, C., Parton, R. G. and Zerial, M. (1994) Association of Rap1a and Rap1b Proteins with Late Endocytic/phagocytic Compartments and Rap2a with the Golgi-Complex. Journal of Cell Science, 107 1661-1670. Fiedler, K., Parton, R. G., Kellner, R., Etzold, T. and Simons, K. (1994) Vip36, a Novel Component of Glycolipid Rafts and Exocytic Carrier Vesicles in Epithelial-Cells. Embo Journal, 13 7: 1729-1740. Stenmark, H., Parton, R. G., Steelemortimer, O., Lutcke, A., Gruenberg, J. and Zerial, M. (1994) Inhibition of Rab5 Gtpase Activity Stimulates Membrane-Fusion in Endocytosis. Embo Journal, 13 6: 1287-1296. Hoxie, James A., Ahuja, Menaka, Belmonte, Elizabeth, Pizarro, Shelly, Parton, Robert and Brass, Lawrence F. (1993) Internalization and recycling of activated thrombin receptors. Journal of Biological Chemistry, 268 18: 13756-13763. Dupree, P, Parton, RG, Raposo, G, Kurzchalia, TV and Simons, K (1993) Caveolae and sorting in the trans-Golgi network of epithelial-cells. EMBO Journal, 12 4: 1597-1605. Parton, R. G., Schrotz, P., Bucci, C. and Gruenberg, J. (1992) Plasticity of Early Endosomes. Journal of Cell Science, 103 335-348. Kurzchalia, Teymuras V., Gorvel, Jean-Pierre, Dupree, Paul, Parton, Robert, Kellner, Roland, Houthaeve, Tony, Gruenberg, Jean and Simons, Kai (1992) Interactions of rab5 with cytosolic proteins. Journal of Biological Chemistry, 267 26: 18419-18423. Zerial, M., Parton, R., Chavrier, P. and Frank, R. (1992) Localization of Rab Family Members in Animal-Cells. Methods in Enzymology, 219 398-407. Parton, R. G. and Simons, K. (1991) Endocytosis in the Kidney - Insights From the Mdck Cell System. Seminars in Nephrology, 11 4: 440-452. Parton, R. G. (1991) Endocytosis in polarized cells. Seminars in cell biology, 2 6: 387-395. Transcytosis in MDCK cells: identification of glycoproteins transported bidirectionally between both plasma membrane domains. Zenker, J., White, M. D., Templin, R. M., Parton, R. G., Thorn-Seshold, O., Bissiere, S. and Plachta, N. (2017). A Microtubule Organizing Center Directing Intracellular Transport in the Early Mouse Embryo. In: ASCB/EMBO Meeting, Philadelphia Pa United States, (). 2-6 December 2017. Role of anionic phospholipids for caveolae formation and function. Hirama, T., Das, R., Parton, R. G., Fairn, G. D. and Grinstein, S. (2015). Role of anionic phospholipids for caveolae formation and function.. In: , , (). .
Collins, B., Kovtun, O., Tillu, V. and Parton, R. (2014). Molecular organization and membrane interactions of the cavin coat complex. In: Febs Journal. FEBS EMBO 2014 Conference, Paris France, (204-204). Aug 30-Sep 04, 2014. Kovtun, O., Tillu, V., Jung, W., Leneva, N., Ariotti, N., Alexandrov, K., Parton, R. and Collins, B. (2014). Structural dissection of architecture of caveolar protein coat. In: Febs Journal. FEBS EMBO 2014 Conference, Paris France, (209-209). Aug 30-Sep 04, 2014. Morone, N., Parton, R. and Heuser, J. (2012). Cavin regulates caveolar endocytosis by forming "crescents" that girdle caveolae, stabilizes them in relatively flat conformations, and links them to cortical actin filaments. In: , , (). .
Chaudhary, N., Howes, M. and Parton, R. G. (2012). Cavins and Caveolins independently regulate the CLIC/GEEC endocytic pathway. In: , , (). .
Parton, Robert G. (2011). New insights into the domains and dynamics of the plasma membrane. In: Experimental Dermatology. 38th Annual Meeting of the Society-for-Cutaneous-Ultrastructure-Research, Brisbane Australia, (E872-E872). 30-31 May 2011. Hybrid organic-inorganic nanoparticles: controlled incorporation of gold nanoparticles into virus-like particles and application in surface-enhanced Raman spectroscopy. McCormack, AJ, Pol, A, Parton, RG and Yap, AS (2001). A role for cholesterol-dependent membrane microdomains in E-cadherin adhesion. In: Molecular Biology of the Cell. , , (479A-479A). .
Parton, RG, Pol, A, Roy, S, Luetterforst, R and Hancock, JH (2001). Caveolin dominant-negative mutants perturb Ras signalling through cholesterol-rich raft domains. In: , , (104-104). .
Wicking, C. A., Evans, T., Wainwright, B. and Parton, R. (2001). Insights into the regulation of hedgehog signalling from subcellular localisation studies. In: -, -, (341-341). -. Interaction of antiphospholipid antibodies with late endosomes of human endothelial cells. de Rochemonteix, BG, Kobayashi, T, Rosnoblet, C, Lindsay, M, Parton, RG, Reber, G, de Maistre, E, Wahl, D, Kruithof, EKO, Gruenberg, J and de Moerloose, P (1999). Interaction of antiphospholipid antibodies with late endosomes of human endothelial cells.. In: , , (484-484). .
Gordon, D., Smith, R. W., Parton, R. G. and Kidd, G. J. (1999). Developmental regulation of microtubule organisation in oligodendrocytes. In: Proceedings of the 39th Annual Meeting of the American Society for Cell Biology. 39th Annual Meeting of the American Society for Cell Biology, Washington Convention Centre, Washington D.C., (B142). 11th - 15th December, 1999. Camakaris, J., Voskoboinik, I., Mercer, J., Lane, C., Parton, R. G., Petris, M. and Strausak, D. (1999). The copper transporting p-type ATPase of Menkes disease. In: Journal of Inorganic Biochemistry. International Conference on Biological Inorganic Chemistry, Minneapolis, Minnesota, (15-15). July 11-16. Lane, C, Parton, RG, Mercer, JFB and Camakaris, J (1998). EM localisation of the MNK copper transporting P-type ATPase. In: , , (205A-205A). .
Stanley, KK, Sleer, LS, Parton, RG and Hailstones, D (1997). Regulation of caveolin and caveolae by cholesterol in MDCK cells. In: , , (1205-1205). .
Caveolin-3 associates with developing T-tubules during muscle differentiation: Evidence for a role for caveolins in plasma membrane morphogenesis. Parton, RG, Way, M and Stang, E (1996). Caveolin-3 associates with developing T-tubules during muscle differentiation: Evidence for a role for caveolins in plasma membrane morphogenesis.. In: , , (1963-1963). .
Ikonen, E, Scheiffele, P, Fra, AM, Parton, RG and Simons, K (1996). Role of VIP21-caveolin oligomeric complex in protein and lipid sorting in MDCK cells. In: , , (1599-1599). .
DESJARDINS, M, HUBER, L, PARTON, R and GRIFFITHS, G (1993). CHARACTERIZATION OF PHAGOCYTIC COMPARTMENTS IN J774 MACROPHAGES. In: , , (30-30). .
PARTON, RG, DUPREE, P, KURZCHALIA, TV and SIMONS, K (1993). LOCALIZATION OF VIP-21, AN INTEGRAL MEMBRANE-PROTEIN OF TGN-DERIVED EXOCYTIC VESICLES, TO CAVEOLAE. In: , , (24-24). .
SIMONS, K, DOTTI, C, DUPREE, P, HUBER, L, KURZCHALIA, T and PARTON, R (1993). SORTING OF SURFACE-PROTEINS IN THE TRANS-GOLGI NETWORK OF EPITHELIAL-CELLS AND NEURONS. In: , , (9-9). .
SIMONS, K, DUPREE, P, HUBER, L, KURZCHALIA, T and PARTON, R (1993). SORTING OF SURFACE-PROTEINS IN THE TRANS-GOLGI NETWORK OF MDCK CELLS. In: , , (262-262). .
DOTTI, CG, PARTON, R, KOBAYASHI, T, HUBER, L, DUPREE, P, STORRIE, B and SIMONS, K (1993). THE EXOCYTIC AND ENDOCYTIC PATHWAYS OF POLARIZED NEURONS. In: , , (264-264). .
DUPREE, P, PARTON, R, KURZCHALIA, TV and SIMONS, K (1992). VIP-21, AN INTEGRAL COMPONENT OF TRANS-GOLGI-NETWORK-DERIVED TRANSPORT VESICLES. In: , , (A308-A308). .
PARTON, RG, BOMSEL, M, GRIFFITHS, G, GRUENBERG, J and SIMONS, K (1991). THE POLARIZED ORGANIZATION OF THE ENDOCYTIC PATHWAYS IN MDCK EPITHELIAL-CELLS. In: , , (717-717). .
PRYDZ, K, BACALLAO, R, PARTON, R and SIMONS, K (1990). ACIDIFICATION OF MDCK CELLS INDUCES A REDISTRIBUTION OF LATE ENDOSOMAL COMPARTMENTS. In: , , (228-228). .
Mammalian lipid droplets: a central role in the organismal antibacterial response? Quantitave real-time PCR instrumentation for rapid, high-throughput gene expression studies. Does PTRF-cavin control endothelial cell migration and angiogenesis? Myosin VI: a novel molecular apparatus for epithelial cohesion. Molecular characterisation of endosome dynamics and organisation. "Probing protein-protein interactions in skeletal muslce t-tubule development, homeostatis and disease". CO-OPERATION BETWEEN E-CADHERIN, PHOSPHATIDYLINOSITOL-3-KINASE, RAC AND THE WASP FAMILY PROTEIN, WAVE, IS NECESSARY FOR PRODUCTIVE CADHERIN-DEPENDENT CONTACT FORMATION.